WordPress has changed how I post on my blog, and I don’t like it! even Nathan my go to techie son is having problems, so I hope this works! Todays card is still kaisercraft Secret garden,the second to last card in this series ( for now) I couldn’t lose this paper, and have filed it away for future card making. 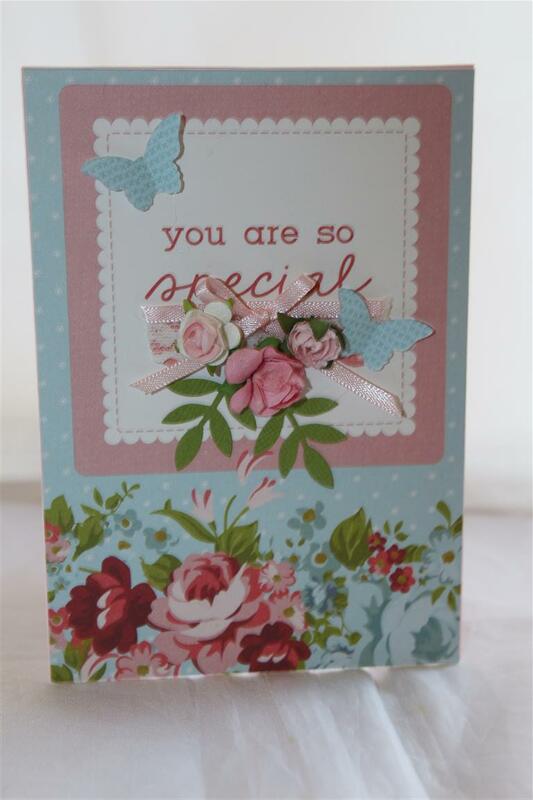 This card has lots of goodies on it – punched leaves and butterflies,ribbon, lace ( a find from a country second hand shop), a doily,flowers and a collectable doily as well. i think this is my favourite, but I do love this paper. Today is a lovely day here weather wise, not too hot, so a good day for a bit of house keeping before a couple of hours in the craft room. til tomorrow…. Kaisercraft secret garden,paper collection and matching collectables. Here I layered some of the doily collectables on top of one another with foam pads, and just went to town with ribbon,lace and flowers,and punched leaves.The pretty lace on the bottom card was a brilliant find in a second hand shop in a country town outside of Adelaide . I visited there with my sister last time I was on holidays’ and found lots of interesting buttons and lace! Today is so much cooler here, it’s lovely, so I am enjoying some relaxing time in the craft room. Til tomorrow…. True to my new years resolution I pulled out some old paper the other day, first up is Kaisercraft secret garden. I loved this paper collection when it came out so I have a lot of it , and I still love it, so it didn’t make the lose it pile – I made a few cards which I will show over the next couple days and the rest has gone back into the shelves.The interesting thibng about this exercise is that since buying the paper I have new dies, stamps etc, so the cards I am making now with the old paper look nothing like the cards I made originally! 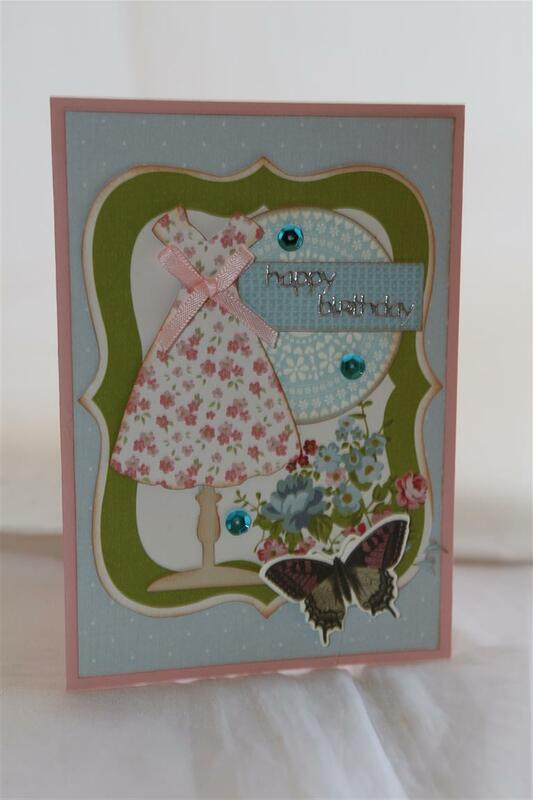 The top card has some butterflies that I stamped onto patterned paper and fussy cut out, the bottom card has a die cut butterfly ( a memory box die), and I added a doily and sequins to that one. Super hot day here, I jumped into a cold shower as soon as I got home – feel so overheated.salads again for tea, this feels like a long summer this year – looking forward to a pot of soup as soon as we get some cold weather. Til tomorrow…. Here are the last 3 cards from my Kaisercraft Secret garden series. 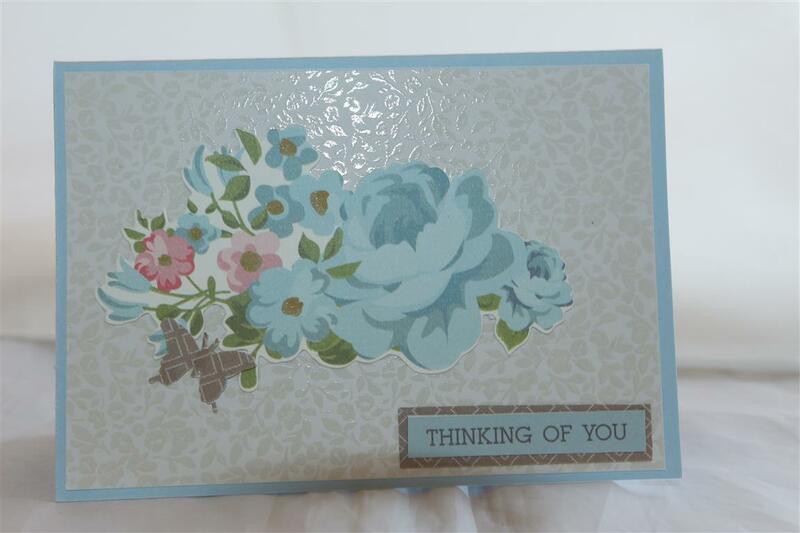 From the top..Pink and blue stampin up cardstock,layered flowers and leaf kaisercraft dies,collectables and the 6″ pad. Middle card..A piece of 12 x 12 paper, the die cuts from the paper pad,ribbon and a butterfly collectable from the secret garden collection. Bottom card…I made a centre step card ( I must do a video for these..will talk to Nathan to organise a time)paper from the 6″pad,a collectable,layered lace and ribbon. The fancy label is a spellbinders die but i am not sure of the name as Mum die cut it for me. Anyway, must go now as I have a class this morning and I am so looking forward to seeing my ladies! 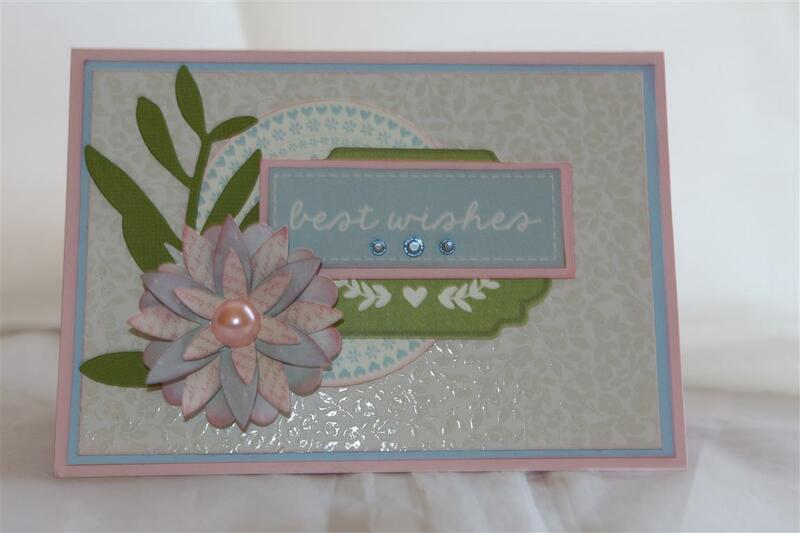 til tomorrow…..
we are coming to the end of my secret garden series – only one more after these two I think!Top card – kaisercraft secret garden 6″ pad,collectables and a kaisercraft leaf die, spellbinders happy birthday die,and assorted butterfly dies and punches. For the bottom card I used a piece of 12 x 12 paper – In all kaisercrafts’ ranges now they have a couple of 12 x 12 sheets with what they call card fronts on them. I don’t think I have used one without changing it but that is half the fun! I covered a couple of the words on this one with some lace and ribbon. 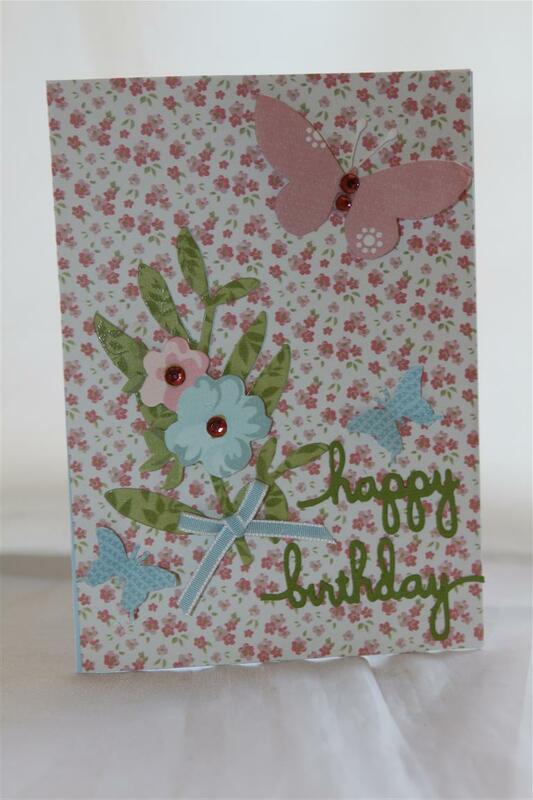 Some lovely flowers and punched butterflies to finish! started work at 6 am this morning, the good thing about that is finishing early, but I am off now for a bit of a nanna nap!Til tomorrow…. Kaisercrat secret garden. 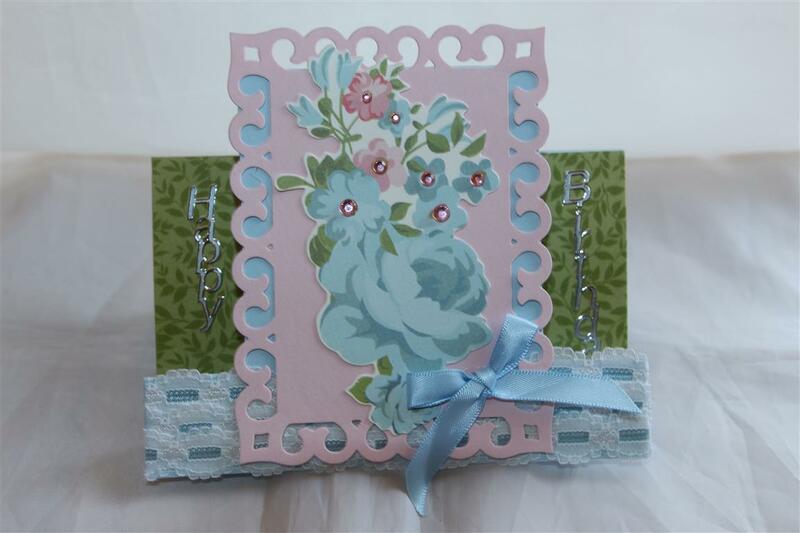 The top card has a piece 0f the 6″ pad as the background, and a piece from one of the 12 x 12 card fronts trimmed down. I used a kaisercraft mannequin die and hand cut a dress from a piece of the 6″ pad.Added a collectable and some sequins to finish this one. 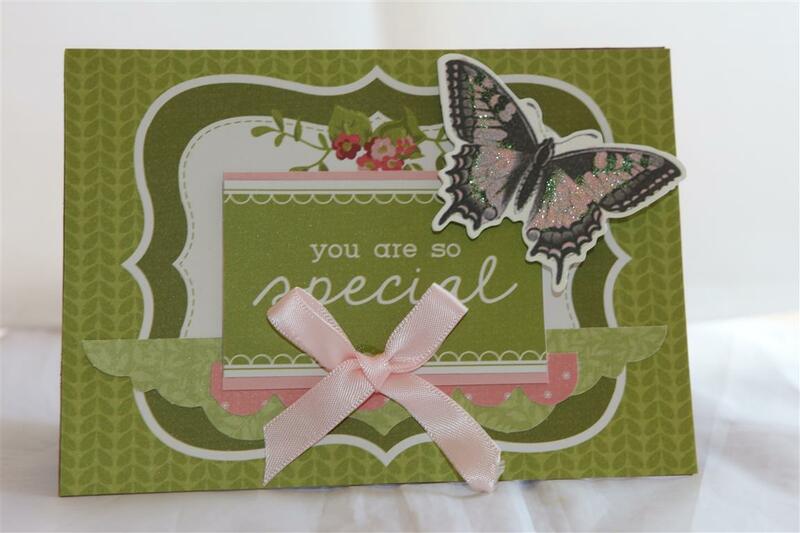 For the bottom card – so simple – a piece of the 6″ pad and a collectable is all this one needed!punched butterfly, and sentiment and done. Freezing day here today, far too cold in the craft room, so after a visit to Mum and dad’s this afternoon, it will be tea in front of the heater and Tv! til tomorrow….